There's no better way to explore the Great Pyramids than on a small boat cruise of Egypt down the Nile River with Adventure Life. In Cairo witness the titanic monuments of Giza, including the Great Pyramid, the puzzling Sphinx, & the smaller pyramids that surround them. Cruise up the longest river of the world, the Nile River, to see the impressively preserved ruins of the ancient Egyptian civilization. At Aswan, you will see the Philae Temple, the Granite Quarry, & the famous Aswan Dam. Then cruise north to Luxor, where you can explore the ghostly tombs of the Valley of the Kings & the Valley of the Queens on the West Bank. You might even see King Tut's solid gold sarcophagus. Contact one of our Egypt experts to start designing your dream trip to Egypt and the Nile today. Explore ancient Egypt on this 4-day Nile River cruise onboard the Sanctuary Sun Boat III. As you sail down the Nile River tour ancient temples, learn about the history of the region, and visit important archaeological sites. Join the Sanctuary Sun Boat IV on this fascinating 8-day round-trip Luxor cruise. Sit down, relax, and discover some of the most historical temples and dazzling landscapes while you enjoy an authentic luxury Egyptian sailing experience tasting some local wine, beers, and culinary delights. Combining cultural discoveries and archaeological marvels this 10-day cruise takes you from Turkey to Jordan via Egypt and Israel. Discover the Mediterranean and the Red Sea, in the footsteps of ancient civilizations. Explore the region of Cappadocia with its “fairy chimneys” and its troglodyte homes. Walk like an Egyptian... literally! 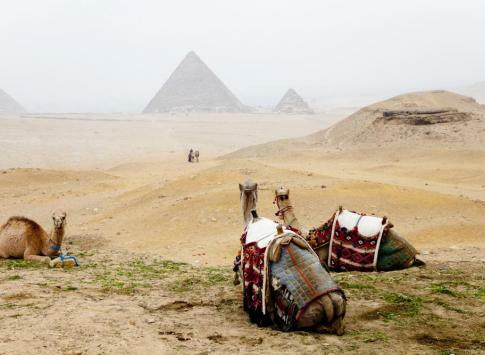 As you embark on your Egypt tour or cruise, you will walk the same lands that Egyptians have crossed for millennia. While many countries have hidden treasures and monuments tucked deep in their jungles, Egypt is not shy about its awe-inspiring memorials. Cairo & Giza: The modern capital of this ancient country, Cairo is home to the extensive Egyptian Museum and also provides a great base for tours of Giza, where the pyramids & the renowned Sphinx are located. Aswan: Best known for the Aswan Dam, you will also see the archaic temples of Philae. Luxor: Called "Thebes" in ancient times, this was one of the main capitals of the pharaohs, where you will explore the haunting Valley of the Kings & Valley of the Queens on the West Bank of the Nile River. Kom Ombu & Edfu: Here there are two temples that you will explore - the Temple of Horus & the Temple of Kom Ombu, a tribute to the crocodile god Sobek. Your passport must be valid for 6 months, and you need either a $25 30-day tourist visa or a $35 multiple entry visa. Gratuities are expected in Egypt and generally start around 10% of service or a few dollars. What is internet access like in Egypt? You will likely be able to find many places in the cities you visit that have free public Wifi, but since all of our Egypt excursions are cruises, don't expect internet on your vesse. Can I use my cell phone while in Egypt? You probably won't be close enough to the cell phone towers to get a signal on your phone. If you do, you will have to replace the SIM chip with one you purchase locally (maybe at the airport). Power in Egypt is 220v with "Types C & F " sockets. These have two round pins. If your devices aren't compatible with this voltage, you will need a step-down converter. You will definitely need a plug adapter. Your boat will have Western style flush toilets but if there is a sign indicating that you should throw waste paper in the basket, you should definitely follow those instructions. You should not drink the water in Egypt, but your cruise ship will have filtered or bottled water for you at all times. Are credit cards accepted in Egypt? Will I be able to find ATMs? Don't expect to find too many ATMs along the way - when you're in the bigger cities, you will likely come across ATMs that accept major international credit cards, but otherwise enjoy the fact that our itineraries are all-inclusive. Take some cash out of an ATM at the airport when you arrive for souvenirs and any tips and you should be covered. While not required, it's definitely a good idea to have travel insurance just in case, and we have some great deals via TravelGuard on our Once You're Booked page. It doesn't take long to see what sets our Egyptian cruises and tours apart - from the moment you board the Sanctuary Sun Boat III or IV, you will feel the intimate atmosphere that promises an exciting trip with exclusive itineraries that help maximize exploration while minimizing the dreaded crowds. You will tour in style from aboard the Sanctuary Sun Boat IV, which even features its own feluccas (the traditional wooden sailing boats), which make your day tours even more private. The expansive sun deck features a pool where you can relax after a long and exciting day of touring, plus modern and elegant lounge and dining areas inside. You'll also feel right at home with your fellow ship mates as you tour the ancient lands of Egypt, as each boat has occupancy for less than 100 people.